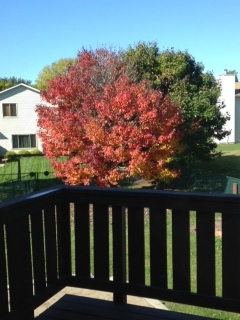 Minnesota nature has been blessing our area with some beautiful colors this year. For some reason, the colors in the sunsets have been amazing, and the colors on the trees, spectacular. 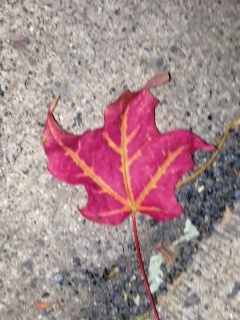 I can’t remember a time when we had such beautiful, vibrant, rich colors in the leaves. I can remember growing up, my dad and I would notice the sunsets and trees. He still will send me pictures of beautiful natural scenes, now just via text and email. The next generation has picked up on this and has started noticing the colors. 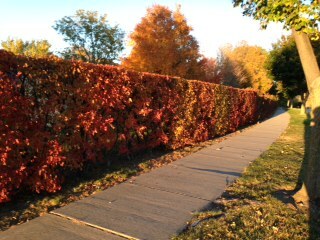 The kids are noticing the trees changing and shouting out colors in the car, on walks, out the windows. Sometimes the argue with me about why the sunsets are so fast, and the colors bleed away to darkness much faster than we all would like. The colors are just passing by us whether we stop to enjoy them or not. Last week, Bug and I were coming home from soccer in another town, and we had to drive east. I felt so badly for her as the sunset was behind us and she was upset she couldn’t see the colors. Before leaving the parking lot, she’d seen the sunset, but it wasn’t enough. She wanted more of the colors and beauty. If it hadn’t been bedtime, I might have just flipped a U-turn and wandered back west for a bit. In fact, next time, I just might. Not to be out done, I’d swear that Bits learned her colors form the leaves on the trees this year. She’ll sit in the backseat and shout out the colors of the trees on a regular basis. It’s been fun watching her appreciate the changing of the seasons even if she doesn’t know what that means. The other day, Peanut stopped everything to stop and share the sunset with me. As she’s taking the time to discover the words to describe what she was seeing, I was able to see it through her eyes. I can’t remember her words, but I remember her joy in sharing it. I remember her heart shining through her eyes as she saw me just absorbing her moment. (I apparently don’t do that enough – note to self). I thought about my dad there, in that moment, because I knew he would have appreciated the beauty of both the environment and his granddaughter. There is pride coursing them me as I considered the lesson learned by my girls. Beauty is around us, but it takes a beautiful heart to see them. And my heart is warmed every time they take a moment to appreciate the natural world. When I’m suddenly seeing the colors or sunset, I have my dad and girls in my heart. And that moment is priceless.